Table ‘A’ corresponds to an explicit tendency within the Valaco materials by which the second given name (a version of ‘Robert’) appears in conjunction with the surname (a version of ‘Wälke’). This matrix alone thus generates 48 known or plausible names for Valaco. Table ‘B’ corresponds to an explicit, albeit occasional, tendency within the Valaco materials by which there appear together either (a) versions of both given names, or (b) the first initial of a version of the first given name (either ‘K’ or ‘C’) in conjunction with a version of the second given name. (To date, there is no evidence of the use of the first given name in conjunction with ‘R’, the initial of all versions of the second given name.) Hence, this matrix generates 36 known and conceivable combinations of given names for Valaco. To date, there are no known cases in which Valaco’s name appears without the use of the surname. Subsequently, the 36 known and possible combinations found in Table ‘B’ would conceivably appear in conjunction with one of the eight known or plausible versions of the surname of Valaco. 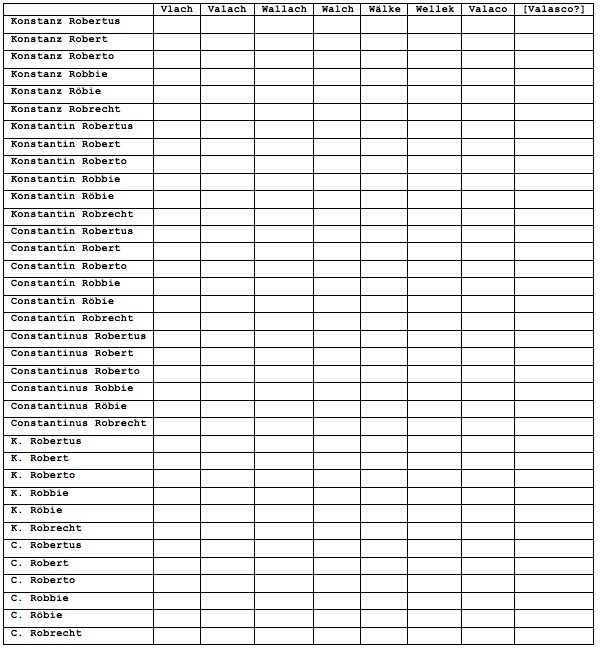 Hence, in additon to the 48 known or plausible names of Valaco generated in Table ‘A’, we may further derive 288 known or plausible names of Valaco by plotting, in a single matrix (Table ‘C’, template only), the 36 known or plausible combinations of given names of Valaco with the 8 known or plausible surnames of Valaco. Based on these analyses, the total number of known or plausible names of Valaco comes to 336.